C.C. 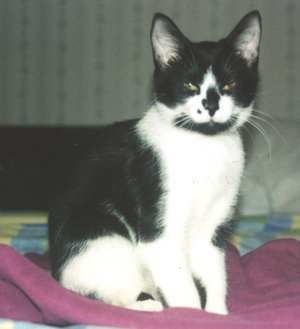 was adopted in October 2002 by MaryBeth, who writes, "She must have some Siamese in here, as she's very vocal - especially at mealtime!" 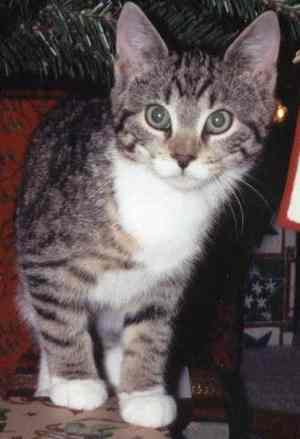 Seamus was adopted in October 2002 by MaryBeth, who writes, "He's such a lovey kitty, always wanting to snuggle next to my neck." 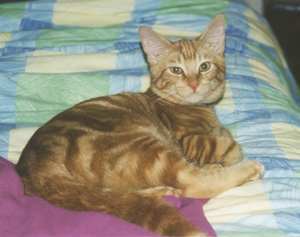 Pamela sent us this picture of Turbo, whom she adopted from us in 1991. She writes, "Turbo, a.k.a. 'His Royal Diva-ness', is a pleasure. 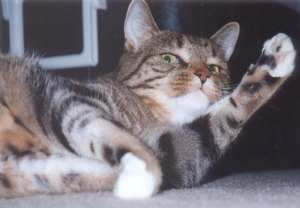 He was adopted in the summer of 1991, one of the happiest days of my life. He is very sweet, intelligent, and personable. He is also quite the conversationalist -- I suspect he is part Siamese. He is just FUN to be around. Everyone who meets him falls in love with him. 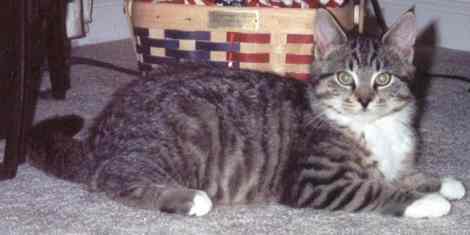 Sarah was adopted in February 2002 by Sheryl, who writes, "Sarah has been doing GREAT !! I thank you so much for helping her find her new mom and new home. She is definitely spoiled. She had a wonderful Christmas and made out like a bandit. She knew just where to find her stocking filled with goodies. You could definitely tell she was enjoying this Christmas !! Sarah constantly follows me around, talks to me, cuddles and purrrrrs. She IS my baby !! 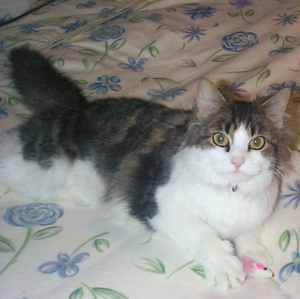 Thank you Kitty Angels for your help taking care of her in the months prior to her adoption." Lorie writes, "just a quick note to tell you how happy we are with the new additions to our family. Our daughters have renamed them Josie (left), and Jake (above). They have adjusted well to our home and are close to making the attachment to our dog. They do a lot of sniffing, and a bit of hissing, but so far, we have been very pleased. "Thank you so much for helping us find our new loves. They have truly made our house a home. We love them so much!"